1. A Constitution ought to be readable to permit a popular vote: this text is unreadable. 2. A Constitution doesn't impose one politics or another: this text is partisan. 3. A Constitution can be revised: this text is infected with a requirement of double unanimity. 4. A Constitution protects from tyranny by the separation of powers and by the control of powers: this text offers netiher a true control of powers nor a real separation of powers. 5. A Constitution isn't imposed by the powerful but is established by the people itself, precisely to protect itsself from the arbitrariness of the powerful, through an independent constituent assembly elected for this purpose. This text emerges from European institutions designed for 50 years by men of power who are at the same time judges and partisans. The translation is my hurried one, and may be imprecise. I have, however, translated correctly and particularly like Point 1 -- the idea that a referendum on an unreadable documents is inherently undemocratic (the Internal Revenue Code, anyone?). The French ex-President Giscard d'Estaing is the midwife of this atrocious document (444 articles compared to 7 in the U.S.Constitution), but France may for once bring honor on itself by voting "Non!" Let us hope it fails now, before it brings on disaster. HT: Christopher Caldwell in the Weekly Standard. Following the pattern of recent jurisprudence, the nominally neutral courts that have already substituted in the public square secular religiosity for actual religion now undermine the sacramental character of marriage with their competing, profane version of that institution. There is mysticism to these new deconstructionists, insisting that each 'marriage' has to be considered on its own terms, independent of the universals. Of course, most deconstructionists would, at this point, say that the law should not and would not sanction as marriage the union of a man and 12 women, or a man and a sow. But they cannot, on the principles enunciated by the supreme courts of Vermont or Massachusetts, say why, for the principles are not themselves rational. No doubt PETA would speak up for the sow. This could be a major disaster, or, let us hope, a soon-forgotten epizootic. In 18 years of in-the-trenches experience counseling kids on their college choices, I've never seen the unhappiness as widespread as it is today. If colleges don't tone down the politics, and figure out how to control ballooning costs, they run the risk of turning off enough American consumers that many campuses could marginalize themselves right out of existence. Colleges are having an ever-harder time making what they do comprehensible to the families footing the bills. I counsel families of all political stripes -- liberal, conservative and in-between -- and varied income levels, but they all agree on one thing: the overly politicized atmosphere on campuses is distracting colleges from providing a solid education to our young people. Why students should start their life out in debt, parents should postpone retirement, or alumni contribute hard-earned cash so that students can listen to the Ward Churchills of the world, is a puzzlement. Perhaps parents really should consider sending their kids to trucking school, notwithstanding some second thoughts on the subject. There's only a little old man behind the curtain. George Soros and others have funded a Yale Law School conference on The Constitution in 2020. One of the two lead speakers was law professor Cass Sunstein, something less than an ornament of the University of Chicago. Sunstein wants to establish a "Second Bill of Rights" that will enshrine rights to economic equality, as opposed to the present Bill, which is a restriction on what the federal gummint can do to the people. Talk about arrogant elitists completely divorced from the society they would blithely reform. It strikes me that we freely use the term “progressive,” but it isn’t clear that we have an articulable definition. While I’m not suggesting that we should or could reach consensus, I do believe we need to achieve some clarity. Right now, the progressive movement is dancing around the issue. We need to do more than erase “liberal” and substitute “progressive” or add “not” in front of “conservative.” Without some guideposts, it will be difficult for us to articulate our understanding of the Constitution and where we want to be in 2020; to define our understanding of the roles of Congress, the President, the courts, and state and local government; or to build a movement – distinct but related tasks. This stuff makes me as sick as Larry Summers made Nancy Hopkins. See my earlier post on "progressive" here. The big shots have other things on their minds. In New York there's a football stadium that the power brokers want to build. In Washington, the focus of presidents of the United States, past and present, has been on who would get to go to the pope's funeral. In Los Angeles the other day, the black celebrity elite turned out en masse to profile at Johnnie Cochran's funeral. Youngsters dead and dying? Nobody of importance is much interested in that. He's right. But would an increased police presence, say; the death penalty for 17-year-old murders, Europe be damned; or serious, disciplined education elicit support from black leftists like Maxine Waters or Charlie Rangel? The question contains its own answer. So far as it makes any sense to predict the future, it seems to me highly probable that the world of 50 or 100 years from now will bear a close resemblance to Huxley’s dystopia — a world without pain, grief, sickness or war, but also without family, religion, sacrifice, or nobility of spirit. It’s not what I want, personally, and it’s not what Huxley wanted either (he was a religious man, though ofa singular type). It’s what most people want, though; so if this darn democracy stuff keeps spreading, it’s what we shall get, for sure. If we don’t bring it upon ourselves, we shall import it from less ethically fastidious nations. In that context, the late pope will be seen — assuming anyone bothers to study history any more — as a rearguard fighter, a man who stood up for human values before they were swept away by the posthuman tsunami. There is great nobility in that, but it is a tragic nobility, the stiff-necked nobility of the hopeless reactionary. You might say that John Paul II (who, you do not need to tell me, would have pounced gleefully on that word “hopeless”) stood athwart History crying “Stop!” Alas, what is coming down History Turnpike is a convoy of 18-wheel rigs moving fast, and loaded up full with the stuff that got Doctor Faustus in trouble — knowledge, pleasure, power. They ain’t going to stop for anyone. Homo fuge! Derbyshire has a point. It's not a criticism of John Paul, but a reflection on our age -- the heartland of European Catholicism has become secular, sterile, and apparently on the rode to dhimmitude. Do we believe in miracles? It seems that the GIP (Polynesian Intervention Group) has been persuaded to lift its blockade of the port area of Papeete. Oscar Temaru had to back down a bit. The whole thing will come to a head again in three weeks. It's very hard for an outsider to figure out what is really going on. The namby-pamby branch of liberalism epitomized by the New York Times editorial page usually claims to support freedom of expression and freedom of conscience as public goods. But not always In this editorial entitled "Moralists At the Pharmacy," the Times comes out for forcing pharmacists, as a condition of keeping their licenses, and thus their livelihoods, to dispense both the "morning-after" pill and birth control medications. The Times condemns those pharmacists who, mostly for religious reasons, choose not to dispense such medications, and supports measures to compel them to violate their consciences in order to comply with the Times's view of right and wrong. It is striking, first of all that the Times, in its very title, condemns "moralists." Presumably a "moralist" is someone who follows a moral code stricter than that espoused by the paper's editorial board and publisher. The Times, of course, also espouses a moral code, strange though it is and uncertain though its origins may be. Everyone has an ethos, even those who proclaim indifference to morality. In a free society, freedom of conscience ought to amount to more than Lewis Carroll's question,"Who is to be master?" If this is so, many will make choices others condemn. Why pharmacists should not enjoy this same right is unclear. The Times's best arguments are that in rural areas, a choice by a pharmacist not to sell certain products might render them completely unavailable, or at least discourage the customer who wishes to obtain them, and that certain groups might pressure pharmacists to follow the groups' views and decline to carry these items. Although speculative, both scenarios are plausible. However, the internet and overnight delivery make almost everything available in rural areas that is available in Manhattan. Nor should freedom of conscience be tolerated only if it is convenient. Would the Times require rural general store owners to sell guns and ammunition, against the owners' conscience, even if necessary to self-defense, in emergency situations? Probably not, because to the urban liberal, weapons and self-defense are Bad Things. Birth control and abortion, on the other hand, are Good Things. The Times types generally condemn those in public life who would "legislate morality" and impose their moral views, or even those of the majority, on the whole society, whether the issue is school prayer, divorce, or homosexuality. But the Times sees nothing wrong in legislating compulsory dispensing of medical devices against the conscience of the dispenser. Footnote: would the Times revoke the licenses of pharmacists who declined to fill prescriptions for suicide medications under that state's assisted-suicide law? I don't want to hear the answer. Update: Steve Chapman takes on the same issue. The New York Times, which I have pretty much written off, every now and then prints something extraordinary. 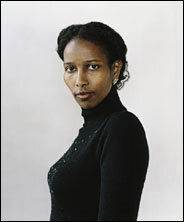 This Sunday, it printed a portrait of Dutch parliamentarian Hirsi Ali. Holland, like much of Europe, is faced with the question of whether it should become a plural society, with Muslims having their own rules, including strict male control of women, polygyny, and "honor" killings, or whether it should impose standards for which its left, sunk in cultural relativism and secularism, can find no principled basis. Although events such as the assassination of filmmaker and iconoclast Theo Van Gogh have led to some reaction, low birth rates, secularism, and lack of conviction provide a basis for believing that Europeans are on the way to becoming dhimmis in their own countries. Hirsi Ali's extraordinary personality and saga well illustrate the choices Europe faces. Hat tip: Little Green Footballs. One survivor, Idit Tzirer, said that she was an emaciated 13-year-old in 1945. She had just been released from a Nazi labor camp and was sitting on a street corner in the snow, too weak to walk, when Wojtyla approached. A life, even of a world-historical figure, is perhaps best understood one human interaction at a time. Tea, bread and cheese. A true sacrament. Another retelling of this story here. HT: Hugh Hewitt. "A blockade of a Papeete road bridge by striking workers prevented New Zealand Foreign Affairs Minister Phil Goff from making a scheduled visit to Tahiti's port. The wild cat action in the capital of Tahiti prompted speculation its timing was aimed to embarrass the new Government of French Polynesia in front of an overseas dignitary. The Polynesian Intervention Group (GIP) parked trucks across the Motuga Bridge, the only access to the capital's main port, on Thursday night (NZT). GIP, with a workforce of about 1230, is responsible to the French Polynesian Government for areas like security, park maintenance, cleaning and some maritime duties. The industrial action over a leadership dispute followed a day-and-a-half long strike last week. GIP was not happy about appointments made by new French Polynesian President Oscar Temaru. The labour force, established a decade ago by former President Gaston Flosse, is locally regarded as Mr Flosse's private police force. Philip Schyle, a politician who supports neither parties of Mr Flosse or his rival Mr Temaru, told the Herald he thought it was no coincidence the second strike coincided with the arrival of Mr Flosse back in the country from Paris. The French government, the colonial ruler of Polynesia, was nowhere to be found. Gaston Flosse, the defeated former President, is a buddy of French President Jacques Chirac. This piece by Jane Galt is modest, thoughtful, and truly thought-provoking. Who is this woman, anyway? Followers of ex-Presidnet Gaston Flosse, a.k.a. the Ferdinand Marcos of Polynesia, have been blockading the port of Papeete, including the petroleum products storage depot. They are members of the GIP or Polynesian Intervention Group, which is supposed to be a disaster relief agency, but doubles in brass as a gang of toughs. The blockaders claim to be protesting the replacement of their Director by an appointee of the newly-elected President of Polynesia, Oscar Temaru. In fact, rumor has it that Flosse is behind this as a way to create a crisis and return to power -- and especially to avoid an investigation of his notorious corrupton. As a result of the blockade, there has been a run on gasoline in Papeete, the capital.